Up to and including Rashi, the Talmudic commentators occupied themselves only with the plain meaning ("peshaṭ") of the text; but after the beginning of the twelfth century the spirit of criticism took possession of the teachers of the Talmud. Thus some of Rashi's continuators, as his sons-in-law and his grandson Samuel ben Meïr (RaSHBaM), while they wrote commentaries on the Talmud after the manner of Rashi's, wrote also glosses on it in a style peculiar to themselves. The chief characteristic of the Tosafot is that they evidence no recognition of any authority, so that, in spite of the great respect in which Rashi was held by the Tosafists, the latter freely corrected him. Besides, the Tosafot do not constitute a continuous commentary, but, like the "Dissensiones" to the Roman code of the first quarter of the twelfth century, deal only with the difficult passages of the Talmudic text. Single sentences are explained by quotations which are taken from other Talmudic treatises and which seem at first glance to have no connection with the sentences in question. On the other hand, sentences which seem to be related and interdependent are separated and embodied in different treatises. It must be added that the Tosafot can be understood only by those who are well advanced in the study of the Talmud, for the most entangled discussions are treated as though they were simple. Glosses explaining the meaning of a word or containing a grammatical observation are very rare. 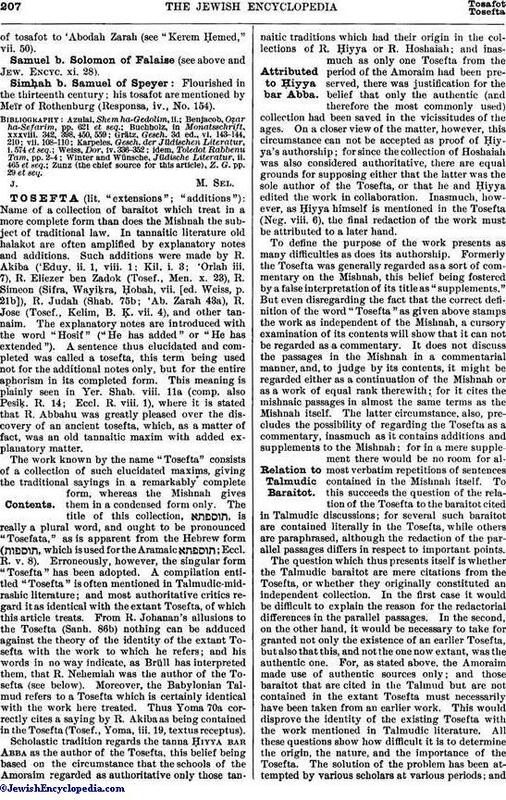 The Tosafot may be considered from the point of view of a methodology of the Talmud. The rules are certainly not gathered together in one series, as they are, for instance, in Maimonides' introduction to the Mishnah; they are scattered in various parts, and their number is quite considerable. Neither are they stated in fixed terms; a generally accepted rule is followed by "This is the way of the Talmud" or "The Talmud usually declares." Sometimes the negative expression is found, "This is not the way of the Talmud." A frequently recurring rule is indicated by some such formula as "We find many like this." It must be borne in mind that what has been said hitherto concerns the general features of the Tosafot, and does not conflict with the fact that the writings of different tosafists differ in style and method. With regard to method, it should be said that the Tosafot of Touques (see below) concern particularly the casuistic interpretation of the traditional law, but do not touch halakic decisions. 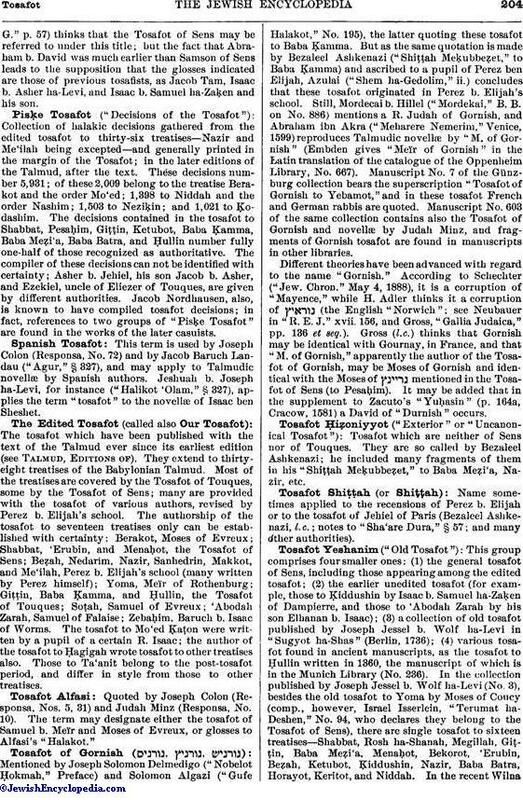 The most prominent tosafist immediately after Jacob Tam was his pupil and relative Isaac ben Samuel ha-Zaḳen (RI) of Dampierre, whose tosafot form a part of the Tosafot Yeshanim (see below). Isaac was succeeded by his pupil Samson ben Abraham of Sens (d. about 1235), who, besides enriching the literature with his own compositions, revised those of his predecessors, especially his teacher's, and compiled them into the group known as the Tosafot of Sens ( ). 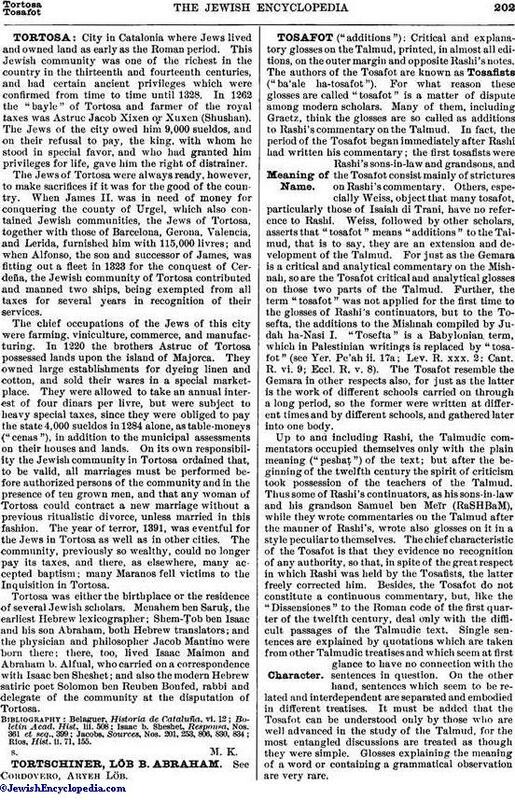 Samson's fellow pupil Judah b. Isaac of Paris (Sir Leon) was also very active; he wrote tosafot to several Talmudic treatises, of which those to Berakot were published at Warsaw (1863); some of those to 'Abodah Zarah are extant in manuscript. 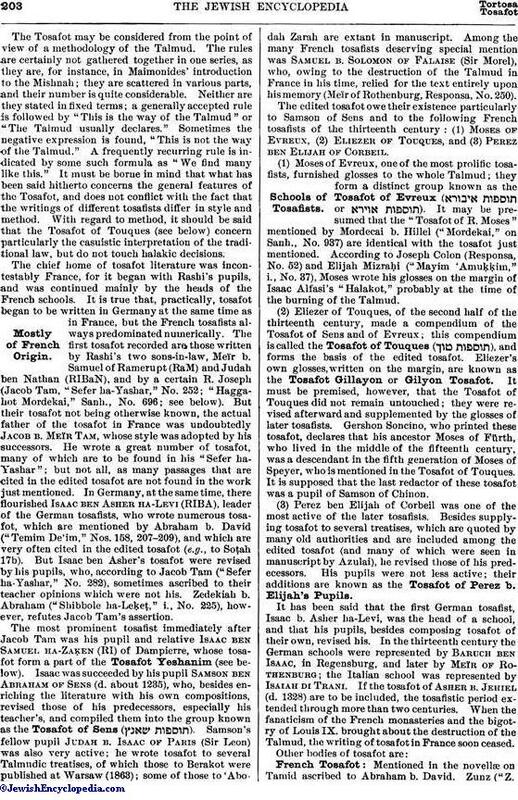 Among the many French tosafists deserving special mention was Samuel b. Solomon of Falaise (Sir Morel), who, owing to the destruction of the Talmud in France in his time, relied for the text entirely upon his memory (Meïr of Rothenburg, Responsa, No. 250). (1) Moses of Evreux, one of the most prolific tosafists, furnished glosses to the whole Talmud; they form a distinct group known as the Tosafot of Evreux ( or ). 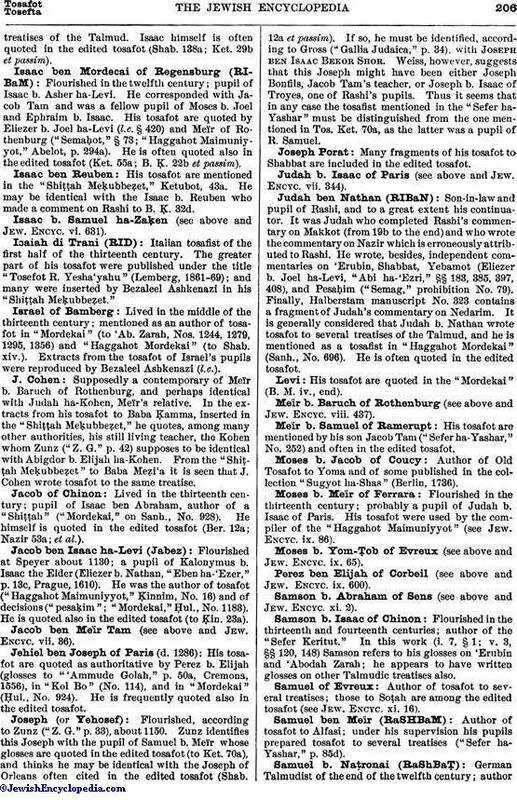 It may be presumed that the "Tosafot of R. Moses" mentioned by Mordecai b. Hillel ("Mordekai," on Sanh., No. 937) are identical with the tosafot just mentioned. According to Joseph Colon (Responsa, No. 52) and Elijah Mizraḥi ("Mayim 'Amuḳḳim," i., No. 37), Moses wrote his glosses on the margin of Isaac Alfasi's "Halakot," probably at the time of the burning of the Talmud. (2) Eliezer of Touques, of the second half of the thirteenth century, made a compendium of the Tosafot of Sens and of Evreux; this compendium is called the Tosafot of Touques ( ), and forms the basis of the edited tosafot. Eliezer's own glosses, written on the margin, are known as the Tosafot Gillayon or Gilyon Tosafot. It must be premised, however, that the Tosafot of Touques did not remain untouched; they were revised afterward and supplemented by the glosses of later tosafists. Gershon Soncino, who printed these tosafot, declares that his ancestor Moses of Fürth, who lived in the middle of the fifteenth century, was a descendant in the fifth generation of Moses of Speyer, who is mentioned in the Tosafot of Touques. It is supposed that the last redactor of these tosafot was a pupil of Samson of Chinon. (3) Perez ben Elijah of Corbeil was one of the most active of the later tosafists. Besides supplying tosafot to several treatises, which are quoted by many old authorities and are included among the edited tosafot (and many of which were seen in manuscript by Azulai), he revised those of his predecessors. His pupils were not less active; their additions are known as the Tosafot of Perez b. Elijah's Pupils. 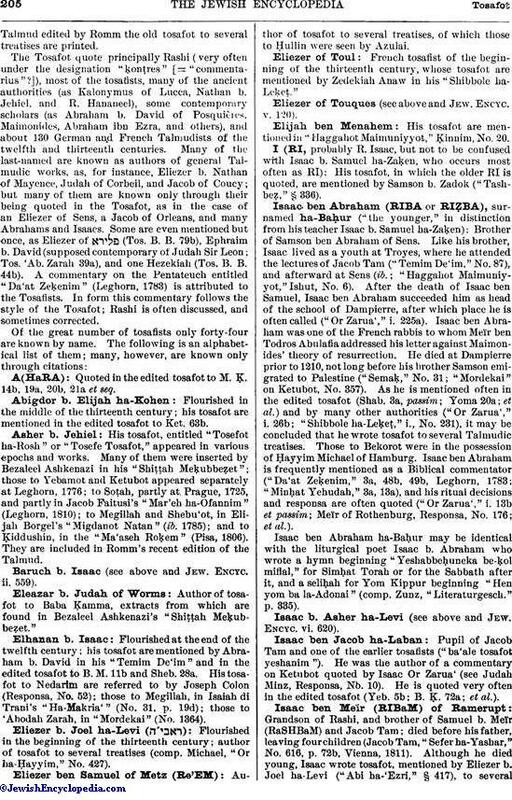 Isaac ben Abraham ha-Baḥur may be identical with the liturgical poet Isaac b. Abraham who wrote a hymn beginning "Yeshabbeḥuneka be-ḳol miflal," for Simḥat Torah or for the Sabbath after it, and a seliḥah for Yom Kippur beginning "Hen yom ba la-Adonai" (comp. Zunz, "Literaturgesch." p. 335). Zunz (the chief source for this article), Z. G. pp. 29 et seq.